As consumers make the switch to online research from in-person dealership interaction, your customers must be equipped with content that captures attention and increases the chance of a purchase. With the rise of digital shopping, it’s more important than ever to equip your customers with powerful tools that increase engagement during the shopping process. Google found that 95% of vehicle buyers use digital as a source of information while researching their next automotive purchase. In fact, twice as many start their research online versus at a dealer. The average car buyer once visited five dealerships before purchasing, but the advent of online research has dropped that number to just two visits. Because salespeople have fewer in-person opportunities to be experts that guide shoppers to their ideal vehicle, solutions that showcase VIN-specific walkarounds, click-and-drag visualizations, and high-quality images can make or break a sale. 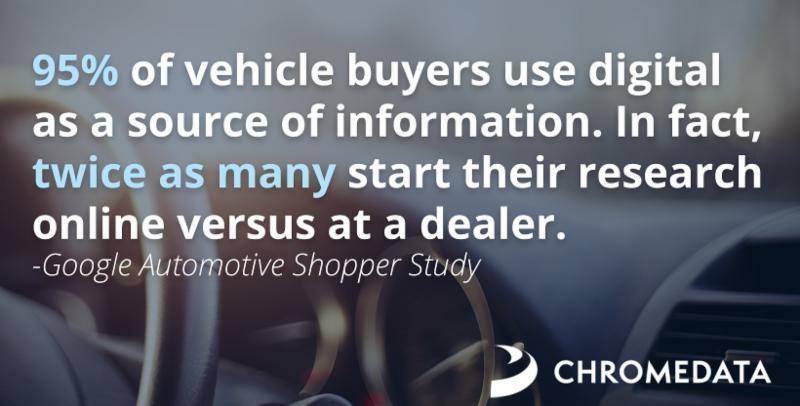 Engagement is key during the research phase of the customer journey, and ChromeData’s full suite of automotive products gives VARs, portal customers, and dealers industry-leading solutions that drive sales. Contact our sales team today for a free evaluation! Or call (800) 936-8906 #2. Will we see you at Digital Dealer 26? Have you lost your free API data service?